0 Comments Published by KL Ocs Kid on Thursday, July 1, 2010 at 6:43 PM. 1947: Born on 9 August, Croydon. 1965-75: Player with Crystal Palace, Gravesend and Northfleet, Maidstone and South African side Berea Park. 1976: Starts managerial career with Halmstad in Sweden, winning two championships. 1980: Joins Bristol City as the assistant manager to Bobby Houghton. 1982: Appointed manager at Ashton Gate but dismissed within four months after poor run of results when club are taken over by new owners. Returns to Sweden, where he manages Orebro and then Malmo, who won five consecutive championships and two Swedish Cups under him. 1990: Leaves Sweden for Switzerland, taking over at Neuchâtel Xamax. 1992: Becomes manager of Switzerland, whom he takes to the 1994 World Cup in the United States. Was in charge when they qualified for Euro 96. 1995: Appointed manager of Internazionale. 1997: Agrees to become Blackburn Rovers manager in the summer. While still at Inter, his side lose to German club Schalke in the Uefa Cup final on penalties. 1998: May – Takes Blackburn into European competition for the first time since 1995 but Rovers win only two of their final 11 Premier League matches to fail in chase for title. November – Sacked by Blackburn with the club bottom of the Premier League, having taken just nine points from 14 games. 1999: Shortlisted for Austria job. Returns to Inter on 27 April as technical director until the end of the season. Joins Grasshoppers. 2000: Appointed coach of Danish side FC Copenhagen. Linked with England job after the resignation of Kevin Keegan. 2001: May – Takes Copenhagen to the Superliga title. May – Takes over as coach of Serie A club Udinese. 10 December – Udinese and Hodgson part company. 2002: April – Appointed manager of United Arab Emirates. 2004: January – Sacked after leading side to fifth place at the Gulf Cup. May – Joins Norwegian side Viking FK. 2005: August – Agrees to take over as manager of Finland. 2007: 30 November – Quits after failing to secure qualification for Euro 2008, and is immediately linked with the Republic of Ireland vacancy. 30 December – Appointed Fulham manager. 2008: Fulham win four of their last five Premier League games of the season to avoid relegation. 2009: After overhauling the squad in pre-season, guides Fulham to their highest ever top-flight finish, seventh, and ensures Europa League qualification. 2010: 18 March – Oversees a stunning second-leg comeback against Juventus in the Europa League quarter-final as a 4-1 win takes Fulham into the quarter-finals 5-4 on aggregate. April – Having seen off Wolfsburg in the quarter-finals, leads the club into the final as they draw 0-0 in Hamburg despite a nightmare journey due to Icelandic volcanic ash, winning the second leg 2-1 at Craven Cottage. 12 May – Hodgson's side go down 2-1 to Atlético Madrid in extra time in the Europa League final in Hamburg. 1 July – Announced as new manager of Liverpool on a three-year contract. 0 Comments Published by KL Ocs Kid on at 6:41 PM. The rumours of who Roy Hodgson wants to bring to Anfield are now beginning to grow as his official appointment draws closer. Brede Hangeland has already been mentioned as a player that he wants to bring with him from Fulham and there are three others in the tabloids today, some that will be greeted with more enthusiasm than others I'm sure. Danny Murphy, who has backed his Fulham Boss' switch to Liverpool, was a well liked and respected player during his seven years with the club. The 33 year old has grown as a player since he left for Charlton (and then current club Fulham) however in my honest opinion I'm not sure how well an Anfield return would go down with the supporters as it'll not be a name to get the blood pumping will it? Danny would jump at the chance I'm sure. Liverpool have been "monitoring" Gilberto Silva at the World Cup, even though I'm still not sure who was doing this unless it was Roy who has always been there or thereabout as the new Reds Boss? The Brazilian international is seen as a ready made replacement for want away midfielder Javier Mascherano. Gilberto has been very good at the World Cup but at 33 isn't getting any younger however he'd do well I think. The name that would excite people the most is Rafael Van der Vaart, who has often been linked with a move to Merseyside, or the Premier League, yet this has never happened. The Dutch international is believed to be happy at Real Madrid however their new Boss Jose Mourinho is going to have to move on some players and England could be his destination. 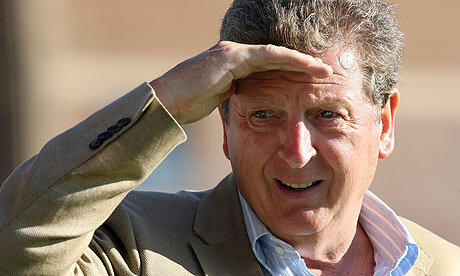 It's believed that Hodgson will have £15m to spend, plus some money that can be generated from player's sales. I worry that Dumb and Dumber will manage to talk Hodgson into selling some of the prized assets with promises of some money however little of that will actually been seen as they'll need this to pay off their debts. We've got to get Roy officially appointed first of all though and then we'll see what happens after this. 0 Comments Published by KL Ocs Kid on at 6:37 PM.